On this page we have a list of estate agents (known in Spain as Nerja inmobiliaria) in the seaside town of Nerja, to the east of Malaga on the Costa del Sol coast of Spain. 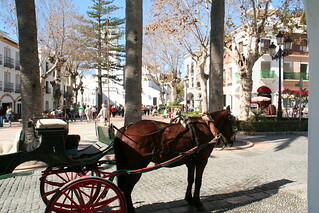 Nerja is the main tourist resort on the eastern part of the Costa del Sol. This former fishing village is arguably one of the coast’s most attractive towns, with pleasant streets of whitewashed houses. Estate agents located in Nerja will also be able to help you find property in towns, villages, urbanisations and developments close to the Nerja area. These include: Punta Lara Canamiel, Urbanisation Cortijo de San Rafael, La Torrecilla, Playa del Salon, La Almijara, Playa de Calahonda, Fuente del Baden, San Juan de Capistrana and Maro. If you want to know all about what it is like living in Nerja and the current property market, then you must read our in-depth interview with Terry Tweedy of Villasol Real Estate on our main Nerja page. Terry, what would you say would be the advantages to living in Nerja compared to other Costa del Sol towns? Nerja has sometimes been called the jewel of the Costa del Sol, as it still retains the friendly Spanish village atmosphere as there are no high rise buildings allowed. With regards to property purchase, there has been a steady increase in value over the last 12 months albeit a moderate one. Confidence has returned to the market, and well presented properties in the range between 85000 Euros and 400.000 Euros are selling quite well. But above this threshold the market is still quite slow. “The LPG (Leading Property Group) is an association of professional estate agents throughout the region of Axarquia on the Eastern side of the Costa del Sol and the inCosta Tropical of Granada in Southern Spain. Our website is updated daily with the latest properties for sale and for rent, residential houses, villas and apartments, commercial premises, bars and restaurants, directly from the real estate databases of our members. Property Sales & Long Term Rentals in Nerja, Frigiliana, Torrox, La Herradura, Almuñecar and La Viñuela on the Costa del Sol of Southern Spain. Avda. Castilla Perez, nº66 Bajo – 29780 Nerja, Spain. Calle Frigiliana, 6 – 29780 Nerja, Spain. Calle Carmen 4, Nerja, 29780, Malaga, Spain. Antonio Millón, 6 – 29780 Nerja, Spain.